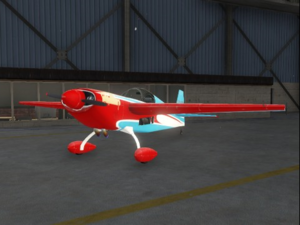 A Mallard in Grand Theft Auto V.
The Western Company Mallard is a stuntplane in Grand Theft Auto V.
The Mallard has a fixed taildragger undercarriage. It is available in two liveries - Sprunk (lime green), and Redwood Cigarettes (blue with red trim). As expected of its class, the Mallard is highly manoeuvrable in the skies. Because of its light weight, it has a short takeoff distance - it can lift off into the air in approximately 3 lengths of the Mallard. Conversely, it is hard to bring it to a full stop from a fast landing, as the nose will attempt to pitch up, and bringing it down too hard will damage it. Crash deformation is also sub-par because of its lightweight construction. As with all propeller planes in the game, the Mallard has a heavy nose that causes the pilot to have to constantly adjust altitude or risk crashing. Michael De Santa may be required to fly a Mallard around the city in Property Management for the Cinema Doppler, dropping leaflets to advertise the cinema. Stuntplane, Grand Theft Auto: San Andreas equivalent. This page was last modified on 21 April 2014, at 10:17.